Caliper Life Sciences Zymark Twister II Bio Robotic Microplate Stacker . New Life Scientific, Inc. This Twister II Microplate Handler is in great working and cosmetic condition as determined by New Life Scientific technicians. There are minor scrapes on the paint of the telescoping arm and marks where the rack components were previously labeled. The Twister II connects and communicates with the compatible Caliper LifeSciences iLink Pro software flawlessly. The Twister II microplate handler is a high-capacity plate stacker with a capacity of up to 400 microplates. The robot can be jogged via the iLink software (a point and shoot interface) or manually. The robot has x-y-z axes, 340° of smooth rotation, and is fully automated. 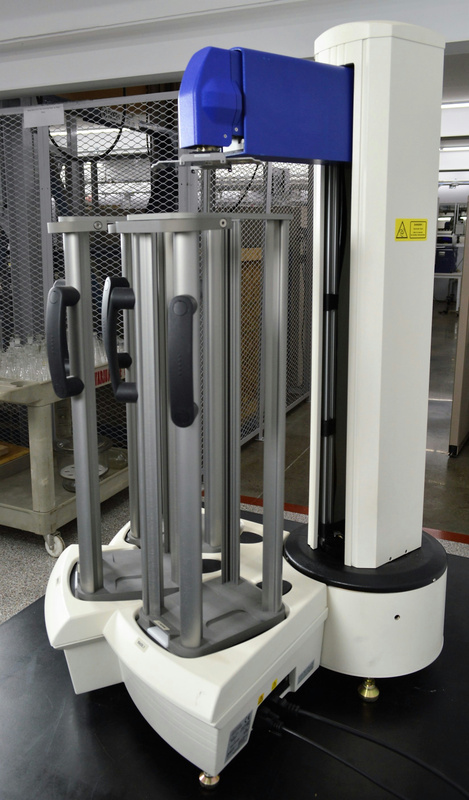 There is a telescoping arm and wrist joint that safely relocates microplates minimizing manual handling. This listing includes the necessary iLink software USB and one three-rack controller base. Please contact New Life Scientific with any questions regarding this listing. A laptop or PC can be purchased from NLS to load the iLink software and control the Twister II. Datasheets can be found here and here.